osemary is a member of the Mint family (Labiatae) that may be grown outside from Zones 8 to 11. As long as the drainage is good, rosemary will thrive even on poor, dry rocky soils. Indeed, in its native range around the Mediterranean Sea, rosemary flourishes in coastal regions so arid that a significant part of the plant's moisture comes from the dew absorbed through the foliage. But though tolerant of drought, this plant is not cold hardy, and this limits its use as a landscape plant even in the South. However, rosemary is an ideal candidate for container cultivation, in which case the plant can be moved to a protected spot during the coldest parts of winter. It's worth the trouble, for this is a most decorative plant. Rosemary tolerates clipping and responds well to training; it is a good subject for bonsai or topiary, and through these techniques, can adopt an endless variety of forms. And whatever the shape, rosemary preserves the same virtues: the needlelike foliage looks good year-round - for rosemary is evergreen - and it smells even better than it looks. The genus name Rosmarinus means "dew of the sea" (a reference to the plant's preference for seaside conditions), while the species name - officinalis - indicates that the plant has been used for medicinal purposes. Indeed, early herbals devoted considerable space to the properties (both curative and magical) of this plant. Rosemary is often planted close to the front door, where people brush against it as they pass, releasing some of the foliage's clean, rich scent. The foliage is popular, fresh or dried, for seasoning various dishes, and is particularly good (in this writer's opinion) with meat and potatoes. ". . . bushes of Rosemary, some just filling the border, and some trained up the wall. 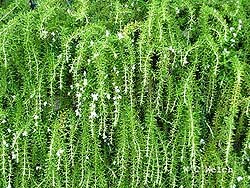 Our Tudor ancestors were fond of Rosemary-covered walls, and I have seen old bushes quite ten feet high on the garden walls of Italian monasteries. Among the Rosemaries I always like, if possible, to "tickle in" a China Rose ('Old Blush') or two, the tender pink of the Rose seems to go so well with the dark but dull-surfaced Rosemary." Rosemary is propagated from pencil-size cuttings taken in fall or early winter. Remove the leaves from the bottom half of the stems, and then stick the cuttings in moist garden soil, where they will root by summer. In moist climates, where rosemaries often prove short-lived, it is a good idea to root new plants periodically to maintain a supply of replacements. Rosemary has flourished in Southern gardens ever since the arrival of European colonists on these shores - and in every colony, for this plant was precious to every group that settled here.